Richard’s cousin Malley has just run off with some guy she met online, and Richard knows that things aren’t as great as she tells him they are. What’s a boy to do but to go after her, along with Skink, a ragged, one-eyed ex-governor of Florida? The unlikely pair find themselves encountering storms, crazed wild hogs, some guns, and massive gators during the quest to find and safely return Malley. Skink—No Surrender is a fast-paced, funny, and thrilling read, with believable (and very intriguing) characters and a great plot. My favorite character was, of course, Skink, the slightly crazed ex-governor. He’s appeared in several of Hiaasen’s books for adults, and it was great to see him make an appearance in this young adult novel. He’s an absolutely larger-than-life character with strong views on integrity, honesty, and the importance of the protection of nature. I really enjoyed his relationship with Richard in the book—Skink is a flawed hero who really sticks his neck out for Richard and for his kidnapped cousin, Malley. Richard was a great protagonist, though Malley left something to be desired—I found her to be flighty and annoying and kind of stupid when it came down to the wire. Regardless, I really enjoyed the twists and turns that the plot of Skink took, especially the way that Hiaasen wrapped everything up almost-neatly. 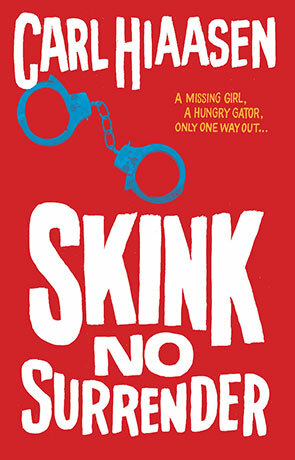 Though Skink—No Surrender is a young adult book, I would recommend it to anyone who likes a fast-paced, fun novel, and to anyone who loves the character Skink from Hiaasen’s other novels. Written on 28th January 2015 by Vanessa.